This Sunday will mark the 47th edition of the Superb Owl. I mean… what? Oh right of course! The Super Bowl! This article assignment makes a lot more sense now. I do love football, while my owl knowledge is mostly superfluous. 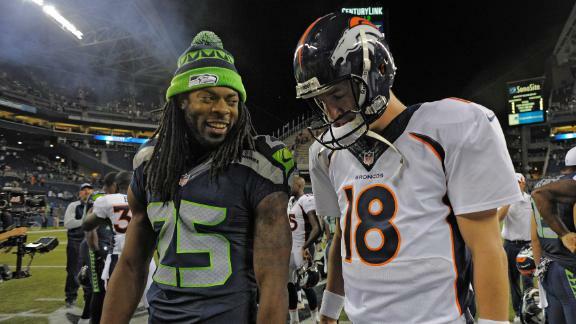 Right, so Seattle is taking on Denver this Sunday in what is purported to be a match-up for the ages. (You can check out Chris Dagonas’ excellent Prop bet/prediction piece here). But honestly, what else are they going to say? No. They’re not going to say that, at least not publicly. They’re going to run stories all week about how athletes don’t like talking to the media (say it ain’t so!) and gossipy articles where writers try to coax smack talk that just isn’t there. Since the Super Bowl and everything it embodies is ‘Murican overkill central, I thought I’d take a look back at the history of the grand game and see how this year’s edition actually stacks up. Sound good? Well, I honestly don’t care! Keep reading, or I’ll find you. (Ed. Note: He will not find you. He can’t even find his car keys). It is really cold. Football! We like speed AND facts right? Sweet! Let’s look at eight! Really fast! 1.The Super Bowl was first played in 1967, when the American Football League and the previous embodiment of the National Football League agreed to merge, as of 1970. To keep fans interested a ‘World Championship’ was to be played between the champions of each league. The 60’s! When fans had to be ‘kept’ interested, instead of bludgeoned over the head with coverage. 2. Kansas City Chiefs Owner Lamar Hunt coined the term ‘Super Bowl’ a play on the traditional college ‘Bowl’ games (there are like fifty million now, but at the time it was reserved for the most important games). He did this mostly as a joke but the media ran with it. It became the official name of the game as of Super Bowl III. 3. After the Green Bay Packers dominated the first two Super Bowls, the merger was nearly cancelled, until Joe Namath’s legendary Super Bowl victory over Johnny Unitas’s Colts in that same Super Bowl III. 4. The trophy awarded to the winner is named after legendary Packers coach Vince Lombardi. It was renamed upon his death in 1970. And if you know nothing about him, seriously, click that link. 5. The Pittsburgh Steelers have won the most Super Bowls, with 6, closely followed by the Dallas Cowboys and San Francisco 49ers with 5 each. 6. Four of the thirty-two NFL teams (Cleveland Browns, Detroit Lions, Jacksonville Jaguars and Houston Texans) have never appeared in a Super Bowl. 7. If you include pre-Super Bowl championships, the Green Bay Packers have the most victories, as they won nine NFL titles and have won four Super Bowls, for thirteen total titles. 8. Both the Minnesota Vikings and Buffalo Bills are tied for Super Bowl futility, losing all four of their franchises appearances. OK! So what does this years game have to offer? Let’s do another eight quick hits! Except… a bit slower. So they’re just…hits? Greatest hits! Booyah. 1. This year’s edition of the game features the first ever cold-weather outdoor Super Bowl. It will be played at the new Metlife Stadium in New Jersey, home to both the New York Giants and New York Jets. This is, at best, a questionable decision. Especially since it’s in New freakin’ Jersey and Bruce Springsteen isn’t involved. 2. The game features both #1 playoff seeds, which is, surprisingly, the first time this has happened since Super Bowl XXVII when Buffalo met Dallas, and of course, lost. 3. A major story of the game is offense vs defense; the Bronco’s are potentially the greatest passing offense of all-time and the Seahawks are nearly their equal on defense, particularly in pass defense. Grantland’s Bill Barnwell does a spectacular and exhaustive job of breaking down the in’s and outs of this here, but suffice to say, this game is a microcosm of the new school pass-only offense philosophy vs the old school run the ball/kill people on defense philosophy. It’s rare that a Super Bowl features teams with such a disparity in styles. The last time it involved a certain QB who wears number 18, back in 2006, when the Colts met the Bears. 4. That QB, Peyton Manning, has done a decent job of playing down ‘legacy’ talk, but winning a second Super Bowl would certainly do a lot to cement his. The crazy 24 hour sports media has even started dissecting his first Super Bowl win, from 2006, stating that it means little, because he beat a team with virtually no offense (led by the immortal Rex Grossman!). Compared to his two crushing Super Bowl losses and many playoff defeats at the hands of Tom Brady and the Patriots, you know Manning wants this one. Bad. If he gets it, he’s on the QB all-time Mount Rushmore, with Montana, Unitas and Elway. If not… well, I hear Brett Favre, Dan Marino and Troy Aikman hang out at something called ‘The Second-Tier Supper Club’ once a month. Try the veal. It’s above average, not perfect. 5. There are roughly twenty geeky tax accountants/lawyers in the USA named Richard Sherman. I googled it. Doesn’t ‘Richard Sherman’ sound like a dude who would have been friends with Screech on Saved By the Bell? Anyway, I assume they’re geeks and I’m not looking any further into it. You can’t make me. There is, however, only one All-World defensive back with the handle. Richard Sherman! Standing up for guys with nerd names everywhere. I am going to go ahead and say this is the first time that the most polarizing player in Super Bowl is also a guy who sounds like he could move your funds to an off-shore account. That’s what people do with money right? 6. People love Peyton Manning and I get it. People love legends. But Russell Wilson! Sweet tap dancing Talulahbell! Beyond the offense vs defense debate, the game also features a traditional pocket passer in Manning vs. the new school mobile quarterback in Wilson. That kicks things up a notch. 7. Marshawn Lynch is one of the NFL’s best redemption stories right now. Discarded by the Bills and a victim of his own poor decision making, he’s reformed himself into a quiet assassin, a man who embodies the old proverb, ‘Walk softly and carry a big stick’. He is also known to sometimes cause earthquakes. No, really. 8. Did I mentioned they’re playing this thing outside?! I feel like I kind of skimmed over that! Plus I didn’t have an eighth point! Anything could happen! Like this! Or this! For those click averse… there was a tornado. And something much, much worse. Guess you’ll just have to click. Oh, I just thought of another point… I’ll cram it in here! If the Seahawks win, it’ll be the first Super Bowl win in franchise history. They lost their only previous appearance to the Steelers in 2005. The Broncos would tack on their third win, in their sixth appearance and move into elite company all-time, tying the Patriots, Raiders and Washington’s football team for fourth most victories all-time. Horse vs. Bird. Serious business. Historical Significance for both individual players and franchises? Check. Permanent points scored for either school of thought in terms of offensive play? Check. Permanent points scored for either school of thought in terms of team philosophy? Check. I’d say we’re in for a ding dangler of a barn burning swamp show here! LET’S DO THIS! FOOTBALL! I know Chris did it already, but I have to throw my pick out there too. Since Manning threw 7 TD’s in Week 1, it’s been Denver’s year. 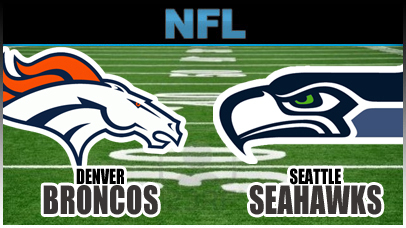 Broncos 27 – Seattle 20. I look forward to Richard Sherman taking Wes Welker down like a deer post-game.